Gazpacho: white gazpacho, red gazpacho, green gazpacho... There are countless variations on this cold "liquid salad". The original form of gazpacho was not particularly classy: peasant food made of bread, garlic, olive oil, salt, and (cold) water. Romans added vinegar. The Moors used crushed almonds and grapes. 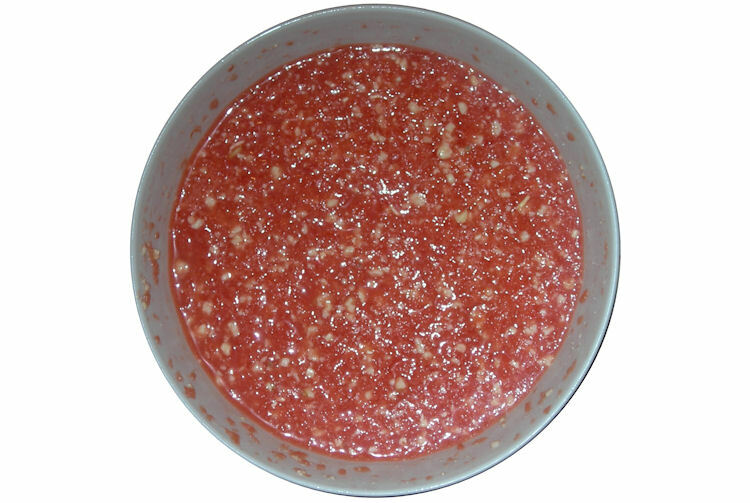 Red gazpacho did not exist until the Spanish conquerors brought home tomato seeds or plants from their expeditions to south and central America ("tomato" is derived from the Aztec word "tomatl"). In modern days, there are no limits - just fresh fruits and vegetables, and always served cold. This recipe is for a gazpacho of watermelon and pine nuts. In 1990s California (entry point in the USA for such traditional drinks from Latin America), it would be called a "smoothie". It is a great non-alcoholic drink (a beautiful oxymoron, isn't it?) for a hot summer day - or night. Makes about 1 liter (1 quart, 4 cups). The melon must be sweet and ripe, but not overripe! No small paper cocktail umbrellas! ©2008-2016 F. Dörenberg, unless stated otherwise. All rights reserved worldwide. No part of this publication may be used without permission from the author.